Penetration of homogeneous (same all of the way through), ductile (bends, stretches, and tears elastically) iron and steel plates, either made for construction or for armor, is a rather complex subject because the metal acts differently when it is very thin compared to an impacting projectile's diameter, when it is of intermediate thickness, and when it is very thick. Projectile nose shape also has a major effect on the striking velocity (kinetic energy) needed to penetrate, at both normal (right-angles or 0° obliquity) impact and at highly oblique angles. Finally, I have recently discovered that the elasticity of the homogeneous plate material as measured by the percentage of its original length that a test sample will stretch under a slowly-increasing tensile load just prior to snapping in two, termed the "Percent Elongation," is important in some cases, though my understanding of this is not as complete as I would like it to be. My computer program M79APCLC is primarily based on the results of extensive testing and comparative analysis of a single standard projectile and single standard armor material done at the U.S. Naval Proving Ground, Dahlgren, Virginia (now the Dahlgren Division of the U.S. Naval Surface Warfare Center) by Dr. Alan V. Hershey from 1942 through 1955. The earlier date is when he arrived at the NPG, but his analysis is based on many earlier tests as well as the enormous number of WWII tests performed after his arrival, and the latter date is when the U.S. Navy shut down armor testing as a primary subject and abandoned it to the U.S. Army's research and development in this area. By the end of 1955 Dr. Hershey and his associates summed up their results in a series of reports (which I have) and transferred over to work on other subjects; he personally stayed at the NPG (throughout all of its name changes and reorganizations) and went deeply into mainframe computer analysis of a number of topics, where the U.S. Navy was one of the leaders in development and use, until his retirement in 1981. To this NPG test and analysis, I have done my own analysis and studied many documents of tests and actual battle damage from many other sources. M79APCLC is a preliminary result of this study, as was my previous computer program FACEHARD for face-hardened naval armor penetration. M79APCLC is not, however, as all-encompassing in its subject area as FACEHARD was in its, though I hope in the future to develop a larger, more universal program that adds computations including projectile damage effects and the effects of other projectile nose shapes, including details on what AP caps, hoods, and windscreens do to penetration, none of which is covered in the existing M79APCLC program. Within its scope, however, M79APCLC is as good as I can make it with my current understanding of this subject and gives much of the same output that FACEHARD gives. In FACEHARD, you would input various projectile and plate information (including many things currently not covered in M79APCLC), as well as the projectile striking velocity and obliquity of impact, projectile diameter, and the plate actual thickness (including materials laminated to its back, which is not covered here either). The program would consider these factors, decide which formulae to use, compute the various results, and then print out the results on screen or on paper, at the selection of the user. If the projectile penetrated entirely through the plate, the angle that the projectile's direction of motion now made with the plate face as it exited the plate's back and the remaining velocity of the projectile would be added to the output, in addition to the calculation of the various "ballistic limits" (minimum striking velocities to achieve specified results against the given plate using the given projectile under the given impact conditions). Much of this is also done in a simplified manner in M79APCLC. However, rather elaborate estimates as to projectile and plate post-impact damage condition, including metal plugs being punched out of the hole in the plate and the chance that the projectile would be tumbling, were also made in FACEHARD, none of which are done in the current simple form of M79APCLC, though some general estimates of some of this information can be done using the results of an M79APCLC computation. The basic projectile used here is the solid hardened steel WWII U.S. Army 3" (7.62cm) M79 Armor-Piercing (AP) Monobloc Shot projectile (one-piece design with no nose coverings of any sort or explosive cavity; only a shallow pit in the base for a burning tracer element). It weighs 15 pounds (6.804 kg) - W/D3 = 0.556 using English units - and is 9" (22.9 cm) or 3.0 calibers (projectile diameters) long. The body is a simple cylinder 5.49" (13.9 cm) or 1.83 calibers long with a narrow copper driving band set into a ring-shaped groove wrapped around it just above the base (there was no streamlined tapering of the base, called a "boattail," as was used in many other WWII and after U.S. Army gun projectiles to reduce drag). The sharply pointed nose is made from a simple curve called a "Tangent Ogive" struck from the arc of a single circle with a Radius of Ogive of 5" (12.7 cm) or 1.667 calibers, whose center lies exactly on the plane of the joint of the bottom of the nose and the upper end of the body, resulting in a smooth merging of the nose and body with no crease or shoulder at the joint (rather few projectile nose shapes are so simple). Such a nose shape with this radius is 3.57" (9.07 cm) or 1.19 calibers tall along the centerline from the nose/body joint to its tip; what is called the "Nose Height" (NH) and it is calculated for a Tangent Ogive nose shape using the formula NH = SQRT[(Radius in Calibers) - 0.25]. This nose shape is about midway between the long pointed noses used in most WWI AP projectiles and the blunter, though usually still pointed, noses used in most WWII AP projectiles (all U.S. Navy mid- and late-WWII AP and "Special" Common projectiles being exceptions with very blunt, oval, round-tipped noses) - in either case we are always ignoring the projectile's AP cap, hood, and windscreen, if any, when we say "nose shape," unless specifically stated otherwise. My program allows the projectile's weight and diameter to be changed over quite a large range without noticably compromising the results for the projectile under study. However, the formulae used are for iron or steel projectiles of at most four caliber length and W/D3 = 0.89 (equal to a flat-nosed iron cylinder four calibers long) and at least one caliber length and W/D3 = 0.148 (equal to a spherical solid iron cannon ball). Projectile size can vary over a huge range - I think my formulae work from rifle bullets to the German WWII DORA 80cm (31.5") gun, as long as we are considering unbreakable, non-deforming steel projectiles with the M79 nose shape hitting the appropriate armor type (see below). Since the projectile's nose shape is fixed in M79APCLC, no matter what values for weight and diameter are used, only the standard M79 projectile's adjusted penetration will be simulated as various plate and impact parameters are changed, not those of a flat nose or hemisphere, for example, which give very different results! This clearly restricts the application of this program, but it is a first approximation and I hope to expand its range of application in the future. Also, though the formulae give values for over 3,500 feet/second (1066.8 m/sec) ballistic limits, this velocity is actually the maximum that can be considered when specifying the striking velocity (the program cuts you off at this velocity). The reason is that shock and heating effects begin to occur that always destroy a steel projectile and begin to melt the projectile and plate, which is why tungsten (wolfram)-carbide and depleted uranium are used in such high-velocity projectiles and not steel. Since the rules change, the formulae in M79APCLC no longer work, which is of no real consequence with actual Service guns firing actual Service steel projectiles; most never get anywhere near this muzzle velocity. The following figures give some idea of the simple army 3" M79 projectile design and its differences from the more complicated WWII naval armor-piercing projectile designs. 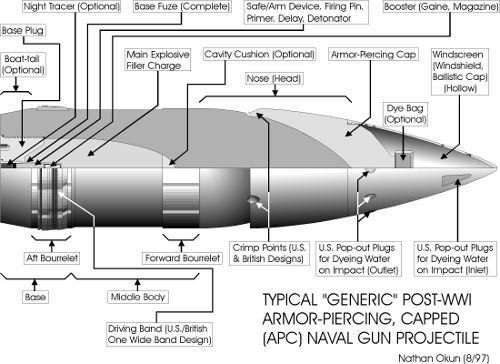 The standard homogeneous, ductile armor used by my M79APCLC program is average 225 Brinell hardness, 115,000 lb/in2 ultimate tensile strength, WWII U.S. Navy Bureau of Ordnance Class "B" armor (non-face-hardened gun mounts, conning towers, and belt armor made by Bethlehem Steel Corporation, the Midvale Company, and Carnegie or, later after a name change, Carnegie-Illinois Steel Corporation (still later, U.S. Steel Corporation)) and the very similar WWII U.S. Navy Bureau of Ships Special Treatment Steel (STS; made exclusively by Carnegie or Carnegie-Illinois Steel Corporation). This armor has a Plate Quality Factor against penetration of exactly 1.00 by definition and it has a Percent Elongation of 25% - any material with this Percent Elongation or more is considered "standard" and the effects of Percent Elongation are zeroed in the penetration formulae, though some materials with lower values of Percent Elongation, such as WWII German Krupp Wh armor with its Percent Elongation of only 18%, also have a 1.00 Plate Quality Factor. Both the Plate Quality Factor and Percent Elongation will raise or lower the Navy Ballistic Limit (NBL, the minimum striking velocity to barely completely pass through the plate with the minimum possible remaining velocity afterwards) equally at all impact obliquities when applied to their respective portions of the penetration formulae. Note that the Plate Quality Factor is not applied before the various formulae using plate thickness as a parameter, since it has the effect of altering the plate's effective thickness against penetration as to the final NBL value, but this cannot change the geometric effects of thickness as a fraction of the projectile's diameter and impact obliquity, which are the same for all plates, no matter what they are made of, as long as they are homogeneous and ductile and they are hit by projectiles within the range of parameters given under Projectile Standard. Note that the term "ductile" means that the plate can stretch and deform prior to splitting open to let the projectile through and that the plate does not break prior to allowing the projectile to pass entirely through if hit above the NBL for that plate against that projectile at that obliquity angle. After the projectile has exited the plate, small pieces of plate material surrounding the hole may break off, but never before they have provided their maximum resistance contribution to the total trying to stop the projectile. Usually for steel armor, this means that the armor steel has no major internal flaws (bubbles, pipings (long tube-like bubbles), cracks, laminations (unless already taken into account by special calculations), and any other irregularities) that compromise the meaning of "homogeneous" and that it be at most about 300 Brinell (32 Rockwell "C") hardness, though somewhat harder WWII homogeneous armor-grade steels can sometimes still act in a sufficiently ductile manner to satisfy this definition when hit at low obliquity by a pointed projectile (some German WWII high-hardness tank armor, for example). Details concerning the manufacture and history of homogeneous, ductile and face-hardened armors and ship construction steel and wrought iron, including STS and Class "B" armor, are found in my Table of Metallurgical Properties of Naval Armor and Construction Materials dated 16 December 1997. It also contains the Percent Elongation and approximated Plate Quality Factors for other iron materials used in ships, as discussed in more detail in the next section. The Plate Quality Factor (PQF) gives a rough average of the given armor's NBL as a fraction of the NBL of a standard STS plate under identical conditions hit by a projectile 8" or less in diameter (to eliminate any Percent Elongation effects, see below). Normal impact with an indestructible, non-deforming, standard-design projectile would give the "purest" results, but many tests are at other obliquity angles with not-so-good, non-standard projectiles and must be calibrated using known nose shape and projectile damage effects, if both plates were not hit by identical projectiles at the exact same obliquity and suffered the exact same damage (hopefully none for really reliable results!). The PQF is due to the plate's slowly-applied ultimate or tensile strength as modified by its toughness (resistance to cracking under impact shock); only if the maximum strength can be reached prior to the plate cracking - that is, only if the plate is tough enough to remain ductile until the plate has completely torn open - will its ultimate/tensile strength be a true measure of its resistance (once scaling has been taken into account). Plates that are of high strength, but too brittle (crack too easily under impact), will break prematurely and no matter how strong they might be when the load on them is applied slowly, as armor they leave much to be desired. Brittleness itself is mainly due to a metal's slowly-applied yield strength (where the material first begins to permanently deform during the tensile strength test as the pulling force is gradually increased) being too close to its ultimate/tensile strength so that a sudden shock (as in an impact) can increase the force for an instant above the ultimate/tensile strength level - before the material can react and begin to lower that force by "giving" due to the force exceeding its yield strength - and this allows a crack to start that eventually leads to the failure of the entire metal article as the crack spreads. (Face-hardened armor would always be in this inferior category if it were not for the fact that the projectile can be made to suffer even more damage than the plate, or at least suffer its damage more quickly, enhancing the plate's resistance at low obliquity, where stopping the projectile rather than merely deflecting it is the major method of resistance, even though the plate's face layer is indeed very brittle.) Note that the PQF is not applied to any values of plate thickness being used to determine the effects of impact obliquity or to select the thickness range of the applicable thickness-to-velocity table of constants to apply to this specific impact; these are geometric effects that depend on the true plate thickness, not on its relative resistance to penetration compared to the standard armor type. 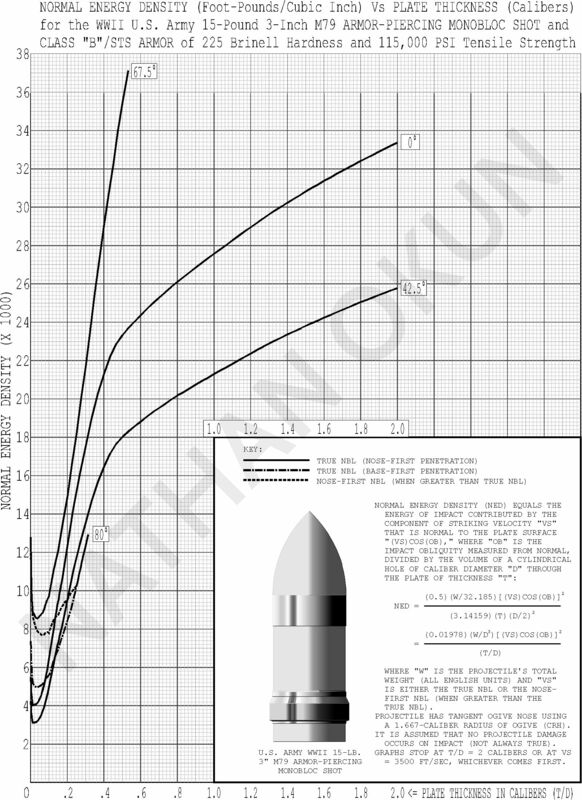 The PQF is only applied once to the final plate thickness calculation for converting all of the information on the specific impact into an NBL value. The PQF in the M79APCALC program automatically adjusts for absolute scaling (T), relative scaling (T/D), and impact obliquity (OB) for the given plate parameters (Percent Elongation = 25%, Brinell Hardness = 225, Ultimate Tensile Strength = 115,000 pounds/square inch (using the original diameter of the sample at start of test; not its stretched, narrower diameter when it snaps in two)). It has been found that the thicker the plate is relative to the projectile (T/D), due to either increasing the actual thickness or inclining the plate to get an effective increase in thickness, the higher the striking velocity needed to pierce it and the higher the impact shock on the plate. This requires a tougher plate to resist shock-induced cracking. However, toughness usually requires softening of the plate (dropping the yield strength faster than the tensile strength to make it more difficult for an impact to increase the impact force to the tensile strength value and thus break the plate prior to the plate "giving" under the blow to keep the force at a lower level and prevent this), so the plate has a conflict between maximum hardness (and strength) and maximum ductility (and toughness). As a result, as hardness is increased from the minimum to the maximum, the resistance initially gradually increases with the increasing strength until the hardness has used up all of the "reserve" toughness in the metal, then it has a flat constant resistance with increasing hardness for a short time (when the petals at the plate back just snap off after being folded back 90°, this maximum has been reached) and then the plate begins to crack prior to being completely stretched, which rapidly drops the resistance with increasing hardness from then on as the plate cracks earlier and earlier after the impact begins (brittleness sets in). The plateau of maximum resistance goes to softer and softer values as T/D and/or OB increases, dropping the point of maximum resistance to a lower and lower point on the shallow hardness ramping-up-with-hardness portion of the resistance versus hardness curve (this is why there is the SCALEFACTOR term in the penetration formula). Absolute scaling (T-dependent) also occurs due to the fixed speed of sound, crystal size, and so forth in all plates of the same kind, regardless of size, as is mentioned elsewhere, which tends to gradually decrease the strength of the metal as it gets thicker and local effects begin to dominate over effects that include the entire plate. This is usually reflected by simply making the plates softer as they get thicker to maximize toughness, regardless of the projectiles that will be used against them. "LOGe( )" is the Natural Logarithm (base e = 2.718281828...) of the value in parentheses. "SQRT( )" is the square root of the value in parentheses. "W" is the projectile's total weight in pounds. "D" is its diameter in inches. "T" is the plate's total actual thickness in inches. "OB" is the impact obliquity in degrees. "BHN" is the plate's Brinell Hardness Number. This gives an approximation for the average British projectile's NBL against NCA in feet/second. Using the variation in BHN for the given armor, find the average BHN value "BHNAVE" (for U.S. Navy WWII STS and Class "B" armor BHNAVE is obviously 225 BHN). If the range is, say, 190-210 BHN, then the BHNAVE would be 200 BHN, unless you have some other data source that says otherwise. Assume the given PQF for the armor applies exactly as is to that BHNAVE thickness plate - thus the British BHN formula is not used for the average plate, as M79APCLC will give the best result for our purposes unchanged. Calculate the ratio "BHNRATIO" of the actual or estimated plate BHNT and the average BHNAVE for that plate type, BHNRATIO = BHNT/BHNAVE, use that as the change in BHN "BHNMOD" as if 225 were the average BHN value, so that BHNTMOD = (225)(BHNRATIO). Now recalculate the British NBL using BHNTMOD instead of 225, but otherwise using the same inputs, to get "NBLBHNT." and use PQFBHN instead of PQF in the M79APCLC program (all other factors are unchanged from an "average" plate calculation using M79APCLC). This method gives some reasonable portion of the variation caused by changing the BHN away from the average value for that plate type (average may mean the "typical" value and not the exact center value for some plate types), to which the regular PQF value is applied. It is only a rough approximation. "NBL(STS+PQF)" is the NBL calculated using the appropriate Plate Quality Factor applied to STS with the Percent Elongation effects ignored. "SQRT()" is the square root of the value in parentheses. "LOGe( )" is the Natural (base "e" = 2.718281828...) Logarithm of the value in parentheses. Note that the scale effects pivot about D = 3", where LOGe(1) = 0, so the formula is centered (gives SF = 1.00) on the 3" M79 projectile results, as it should be. Homogeneous, ductile armor hit a normal obliquity by a projectile with a sharp point has various methods of resistance which vary as to their relative importance as plate thickness as a fraction of the projectile's diameter (T/D ratio) changes. Plates absorb projectile energy in their effort to prevent penetration in several ways, with the method or methods which are doing the most in the given test conditions varying with relative plate thickness, projectile nose shape, obliquity of impact, and projectile striking velocity. In our limited case using M79APCALC, the projectile is assumed to have a rather pointed nose of fixed contour which does not punch out an much plate material during the impact and which does not suffer any damage due to the impact. Striking Velocity (VS). This is the velocity of the projectile's center of mass at the instant of initial impact with the plate. Obliquity Angle (OB). This is the angle that the projectile's direction of motion vector along which VS is pointed - not necessarily the projectile's nose though a small nose yaw angle can be added to OB in the manner mentioned below - measured from the imaginary "normal" line projecting out of the face at the center of the initial impact site at right angles. Normal impact or normal obliquity means OB = 0° at right angles to the plate face. Note that the program assumes that the projectile's nose on impact with the plate is exactly aligned with its direction of motion; that is, there is no yaw angle. In real life, the various forces on a projectile during flight and, most especially, after a previous impact, will cause a definite yaw to occur, sometimes one that is corkscrewing ("nutating") about the direction of flight; in extreme cases, the projectile may even begin to tumble end over end. If the yaw angle is under 10°, merely cutting it in half and adding the result to the obliquity angle as a geometric adjustment to the impact obliquity in the yaw direction is good enough to take it into account, if desired. Any larger yaw angle will cause rather random effects and can be considered to be a form of projectile damage, which we are not including here. Also, note that the maximum obliquity angle allowed by M79APCLC is 80°. Impacts at a higher obliquity (90° is of course the absolute maximum for a projectile barely skimming the plate surface) are always assumed to ricochet off, no matter how thin the plate is or how high the striking velocity or how blunt the projectile's nose (this last is not a factor here, of course), though a long slot-like tear all of the way through the plate may occur in the process if the plate is very thin. Remaining Velocity (VR). Only defined if the projectile completely penetrates the plate (VR after ricochet is not calculated by M79APCLC). It is the velocity of the projectile's center of mass just after the projectile penetrates the plate, ignoring any effects of gravity. Exit Angle (EX). Only defined if the projectile completely penetrates the plate. This is the angle that the projectile's immediate post-complete-penetration direction of motion of VR makes with the normal line to the plate face at the center of the initial impact site (the same line used to measure OB on the plate face), but here measured from the backward extension of that line out the plate back on the opposite side of the line from OB; the equivalent of the "refraction"of light passing through a prism. The minimum EX value is 0° at the True NBL, when the True NBL is used as the Energy NBL for the VR computation as defined below, and the maximum value is equal to OB, where no deflection at all due to the impact, under any circumstances, though the minimum EX may be greater than 0° if other than the True NBL is used for the VR computation. The angle of deflection of the projectile's path as it passes through the plate is (OB - EX), which is always non-negative. "Energy" Navy Ballistic Limit (Energy NBL). Only defined differently from the "True" NBL in M79APCLC when complete Nose-First Penetration occurs when OB > 45° (ricochet is ignored). The True NBL defines the minimum VS to allow complete penetration, but it does not always define the amount of energy absorbed by the plate in the process. Only if the projectile is brought to a complete stop at the True NBL will it and the Energy NBL be identical, resulting in both VR and EX being zero at the True NBL. If OB > 45° and a Nose-First Penetration occurs, the projectile will usually still be moving at a VR greater than zero along a non-zero EX at the True NBL because at least some, sometimes most, of the resistance that defines the True NBL is due to deflection of the projectile to ricochet, which does not contribute to slowing the projectile down; that is, the True NBL is only partially defined by the energy absorbed by the plate there, so this excess energy (defined by VR) remains even at the True NBL. The higher OB is above 45°, the greater VR and EX are at the True NBL and at higher values of VS. If the projectile penetrates with OB ≤ 45° or if a complete Base-First Penetration at OB > 45° occurs (defined below), then the projectile will be stopped, and both EX and VR will be zero, at the True NBL. where the inverse of the cosine of OB (secant of OB) gives the simple geometric thickness increase of the plate when hit at OB if the projectile penetrates undeflected (i.e., EX = OB). For OB ≤ 45°, M'(OB,T) is a constant for all plate thicknesses (T is arbitrary), usually being somewhat less than 1.00 - gradually decreasing to a minimum of M'(42.5,T) = 0.879, giving an M(42.5,T) = 1.192 and then increasing slightly to M'(45,T) = 0.885, giving an M(45,T) = 1.252 - so angling the plate has less effect on the NBL than actually making the plate thicker to give the same T/COS(OB) value, meaning that inclining the plate and making it taller to cover the same area does not save weight compared to simply keeping it at right-angles to the expected threat and making it thicker to the same weight value. However, for OB ≥ 45°, as OB increases M'(OB,T) gets very large for very thin plates (absolute maximum thin-plate M'(OB,T) where T/D is almost zero being M'(67.5,0) = 1.52, giving an M(67.5,0) = 3.972) and to a somewhat lesser degree for thick plates (maxing out at T/D = 0.9 and remaining constant for all thicker plates for all values of OB ≥ 45°, with the absolute thick-plate maximum being M'(67.5,0.9) = 1.37, giving an M(67.5,0.9) = 3.58), making both very thin and very thick plates good candidates for highly sloped protection, but M'(OB,T) increases much more slowly around T/D = 0.25, where it is a minimum for any given OB, only being greater than 1.00 in the range OB = 56-73° (maximum M'(OB,0.25) is M'(65,0.25) = 1.094, giving M(65,0.25) = 2.589). The value of M'(OB,T) is at its maximum around OB = 65-67.5° for all T/D and then decreases again rapidly to a minimum at 80°, where it is close to its OB = 55° value at the thinnest (T/D = 0) and thickest (T/D ≥ 0.9), but well below its minimum OB ≤ 45° value at T/D = 0.25 (M'(80,0.25) = 0.82 and M(80,0.25) = 4.722). This deepening "valley" in the plate resistance as OB increases above 45° when T/D is near 0.25 is due to the very steep drop in M'(OB,T) as T/D increases toward 0.25 from zero and, to a lesser degree, to the more gradual drop as T/D decreases from 0.9 for a given fixed OB and it means that something unusual is happening near T/D = 0.25, especially when T/D < 0.25. The Base-First Penetrations is one of the results of this unusual behavior. I think that the cause of this minimum M'(OB,0.25) value is that the plate is failing primarily by pure "petalling" at this thickness; that is, the energy absorbed by the plate is due to spliting open the plate in the center of the impact site and folding it back around the edges to open up a hole or, at high obliquity, a long slot to let the projectile through. At high obliquity, this slot-forming method of plate failure takes much less energy per unit plate weight than forming the very wide dent in the plate ("dish") in a trampoline-like thinner plate (some dishing will always occur, but it is at its minimum at and above T/D = 0.25) or wedging the heavy plate material sideways against the resistance of the plate material on all sides of the initial impact point ("plastic deformation") in a thicker plate (which rapidly prevents any realistic hope of penetration at high obliquity as plate thickness increases), in both cases necessary actions before the plate material directly under the projectile can be stretched thin enough to tear open a slot that can be dilated enough to let the projectile through. M'(OB,T) is the value of that parameter calculated for the regular M(OB,T) computation. By multiplying the difference between the maximum and regular values of M'(OB,T) for the given T/D by "(T/D)/0.25" we gradually eliminate the effects of M'MAX as T/D increases toward 0.25 from zero and this smooths the T/D = 0.25 boundary to merge with the True NBL there, as required. Also, when M'(OB,T) reaches its maximum value M'MAX for the given T/D, the merging is smooth for all T/D, again as required. I cannot be sure that this value of the Nose-First NBL is correct for all value of T/D and/or OB in its range of application, but I am sure that it is not far off (the least sure thing is the maximum T/D to use, which might be less than the 0.25 value given here for some OB values, but it will not be too far below 0.25 from test results that I have seen, especially at the highest obliquities). "W" is the projectile's total weight in pounds and 32.185 is the acceleration of gravity in feet/second2 to change weight units into mass units (note when using metric "kilograms" for W this division is not necessary as kilograms already are in units of mass; "newtons" are the metric equivalent of English pounds). VS is usually the True NBL, though sometimes other values of V are of interest (the Energy NBL, for example). The dimensional units of AED are English "foot-pounds/cubic inch," though metric "newton-meters/cubic centimeter" can be used by merely changing the numerical constant from 0.01978 to 0.63662 when T and D are in centimeters, W is in kilograms, and VS is in meters/second. which greatly compresses the vertical scale when comparing various values of OB in this formula/graph. These graphs are directly comparable to the Thompson "F" Formula-based graphs of functions of "F" used by Dr. Hershey's organization at the U.S. NPG. When the normal obliquity True NBL impact energy density (AED = NED) of the undamaged 3" M79 projectile impacting standard U.S. Navy 225 Brinell WWII STS is plotted versus T/D and the data smoothed and a least-squares fit made for plates of T/D values from 0.005 to about 3.5 calibers, which about covers the entire range of plate thicknesses we need to be concerned with, one discovers that the resultant empirical curve looks amazingly like a square-root sign with a curved top instead of a flat one or, alternatively, a check mark with the small leg on the left and the long upward right leg being straight for a time and then curving to the right to get more and more horizontal, though it never quite gets there. All penetrations are nose-first, of course. The short left leg of the check mark is from T/D of zero to about T/D = 0.01 with NED dropping from about 5,800 at T/D = 0 to about 4,200 at T/D = 0.01. The bottom left corner of the check mark is rounded and begins at about a T/D = 0.01, hits bottom in a "U" shape at about T/D = 0.015 and an NED of about 4,020, and then begins to curve up and merges with the bottom of the long right leg at about T/D = 0.085 and NED of about 5,700. The straight lower portion of the long right leg of the check mark curve starts at T/D = 0.085 and goes up in a nearly straight line to about T/D = 0.275 and NED of about 16,300. The very gradually curving portion rises less and less steeply from T/D = 0.275 to T/D = 0.35 and NED of about 20,400. At the T/D = 0.35 point there gradually begins a distinct knuckle in the NED curve until it reaches T/D = 0.465 with NED of about 22,900, bends over abruptly, and it then rises much less steeply and very gradually flattens out in a more and more shallow, slightly-concave-downward, but still increasing, curve until it hits NED of 38,936 at T/D = 3.457, where we stop since we have hit my self-imposed 3500 feet/second maximum VS (the curve could be extended to higher values of T/D, but the results get more and more inaccurate due to heating and shock effects on the projectile and plate changing the rules of penetration if we go too far). Usually we do not need to worry about plates over 2 calibers thick in our study (at least as long as we are dealing with steel and not wrought iron). The range of T/D < 0.01 has resistance to penetration being almost entirely due to the very wide trampoline-like dishing of the plate, which only after stretching back some distance splits open radially in the center to form triangular flaps or "petals" that are folded backwards out of the projectile's path into a ring of "teeth" surrounding the central hole at the top of the high, cone-shaped bulge at the plate back. As the plate gets thicker, the material gets more rigid, the dished area contracts toward the central hole, and the NED actually decreases (the only plate thickness region where this occurs), making the NBL almost constant over the entire region. The graph's U-shaped NED region from T/D = 0.01 to T/D = 0.085 has the increasing thickness of the petals causing them to be more and more difficult to bend back and eventually this increasing petalling energy requirement overcomes the decrease in energy as the dishing area contracts and the combined dishing/petalling energy needed to penetrate increases again. so the increase in complete penetration plate thickness T with VS = True NBL is linear, which means it increases with the square root of the projectile's Kinetic Energy, requiring a rapidly increasing amount of energy per unit of plate thickness increase as the plate uses an all-for-one-and-one-for-all mutual support method of resistance. Note that the petal is a point at its central tip and wide at its base bordering the hole, so the energy needed to bend back a petal is mostly used up bending the petal near the edge of the hole - if the central petal region containing the petal tips is sheared off by, say, a tapered flat nose shape, only if the shearing is done near the edge of the hole (a wide flat region in this case) will there be a significant change in the energy needed to penetrate. For this reason, blunt nose shapes only rapidly change the energy needed for normal-impact penetration of most plate thicknesses when they get very blunt; small changes from the M79 projectile nose shape only have small effects on penetration. This linear T versus VS case is very different from an ideal pure Kinetic-Energy-dependent complete penetration, where each unit layer of the armor is completely independent of any other layer and has an equal energy absorption. In this case, penetration through a thickness T is merely the sum of the energy needed to penetrate each layer in succession; that is, T = (Constant)(W)(VS)2, which has a much more rapid quadratic increase of T with VS = True NBL. No actual plate impacts follow either extreme, though pure petalling (and plunching out a full-plate-thickness armor plug by a flat-nose projectile) most closely approximates the linear T proportional to VS case and pure "sideways wedging" (also called "plastic deformation"), see below, inside very thick plates most closely approximate the T proportional to (VS)2 case. The widely-used French 1890 DeMarre Nickel-Steel Armor Penetration Formula has a single intermediate exponent for T versus Kinetic Energy of T = (Constant)[(W)(VS)2]0.71429, which is almost exactly in the middle between the linear (exponent = 0.5 = SQRT()) and quadratic (exponent = 1.0) T versus VS = True NBL cases. While not very good for very thick or very thin plates, once the Constant had been established for a given plate type (using the "DeMarre Coefficient" for the given armor type), the formula gave rather good results for medium-thickness plates of circa 0.25-0.75 caliber thickness at normal obliquity. At T/D = 0.275 another factor gradually begins to occur that replaces the previous increase in petal thickness, but causes a similar phenomenon to happen at the plate face: A narrow-rimmed, shallow "splash" or "coronet" ringing the initial impact site on the plate face; what I call "cratering" of the face, since the result looks just like craters on the moon. This is the first sign that the material deeper into the plate is now inhibiting the armor material near the face from being pushed back and thus the material is pushed sideways and bulges the face up into a mound with the jagged coronet ringing the central hole. As plate thickness increases over 0.275 calibers, this crater deepens, increasing the face bulge, though the coronet rim stays about the same. Petalling is now happening only in the back layer behind the deepening cratered layer on the plate face, being about 0.25-0.275 caliber thick measured from the plate's back surface. The energy needed to form the crater is less than that needed to bend back thick petals, but still requires the pushing of the entire mound of displaced material sideways and upward against the increasing resistance of the thickening plate material to the sides of the hole, so the rate of increase in the energy curve gradually begins to get flatten out - a horizontal line would mean that the energy needed per unit thickness increase is constant, which is not occurring here, though. At T/D = 0.35, the petals are at maximum thickness at the plate back and the cratered layer on theplate face is at maximum depth, too, at about 0.1 caliber deep, so from now on the additional energy needed to penetrate is due to wedging the plate material in the center of the plate sideways by the expanding diameter of the angled nose surface to form a very wide, shallow bulge in both the plate face (surrounding the higher crater bulge) and back (surrounding the petal bases) made of the displaced material (the thicker the plate, the more material is pushed into this bulge, but the less noticable it is). Between 0.35 calibers and 0.465 calibers, the primary method of plate resistance is rapidly changing from cratering/petalling, which are now absorbing a more-or-less constant amount of impact energy regardless of plate thickness for all plates about 0.425-0.45 caliber and thicker, to pure sideways wedging and the energy needed per unit depth is now quickly flattening out into a constant amount since each further increase in depth goes to forcing the displaced armor material sideways in the plate center, which is more-or-less independent of any material farther away; that is, the resistance is changing to one more like swimming in a pool of water, with the only material affected being the material near the forming tunnel into the plate, not the material of the entire plate thickness such as when the bending petals of total plate thickness was the primary method of soaking up projectile energy. 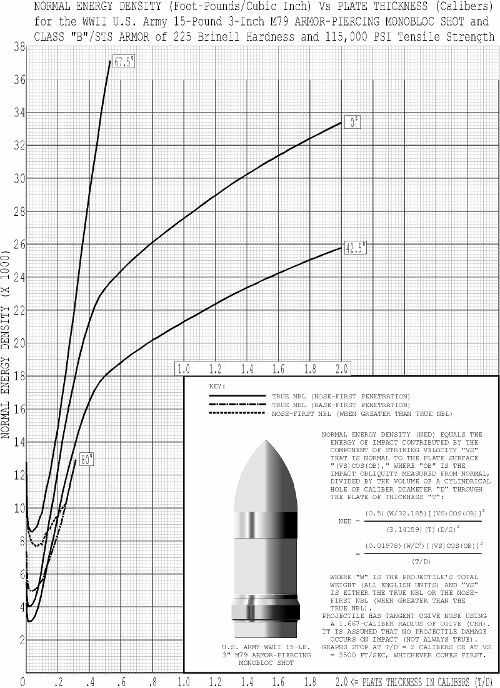 Note that this general normal-impact curve shape is true to more pointed and blunter projectile nose shapes, though they gradually distort the curve by shifting the NBL values where the methods of absorbing the projectile energy change and these changes also raise or lower the NED values at these transition points. More pointed projectiles than our standard M79 nose shape will have a slightly lower NED for each of the normal-impact curve transition points, with the difference for the most pointed designs (for example, some WWI Common projectiles with ogival noses of about 7-caliber radius of ogive) being about 15% lower than with the standard M79 nose shape; however, the T/D values of the transition points are do not change significantly. The M79 projectile nose shape is thus a good example of the typical pointed nose. For blunter noses than our standard M79 nose shape, the change in the normal-impact curve shape is also gradual, but eventually much more extreme for very blunt noses (pure flat noses being the limit here), with the NED value needed for penetrating thick plates increasing more and more rapidly as nose shape flattens out, indicating that the nose is having a more and more difficult time forcing the plate material sideways out of the projectile's path. (Indeed, I do not yet have a ceiling for this increase, since undamaged projectile impacts are virtually impossible against STS-type armor when T/D increases above about 0.75, which is frustrating!) As with thick plates, the NED for very thin plates also rising rapidly (though not as fast or as far as the thick plate increase does) because a blunt nose has trouble starting a tear in such thin, flexible material (as anyone who has tried to tear open a foil or plastic film candy wrapper can testify!). In either case, the increases are gradual until a projectile nose gets very blunt, with most of the NED increase at any plate thickness being in the small change from a tapering flat nose of about 85% flat to a 100% flat nose - even a slight wedging ability has big effects. Also as projectile nose bluntness increases, the minimum-energy U-shaped NED region widens rapidly, with its minimum-NED point moving toward thicker and thicker plates and increasing considerably in value, up to just over NED of 11,000 at about T/D = 0.1 for the 85% flat nose shape. This is also due to the blunt nose having trouble starting a tear in thin plates so that petalling can begin, which increases the depth of dishing prior to petalling taking over and raises the entire NED curve in that region. The center of the impact region is now undergoing failing by shearing out a disk-shaped armor plug of less than projectile diameter in width and, due to geometry/force laws, about half of its width in thickness (what is termed "plugging"), with only the outer ring of armor material outside of the plug region being wedged sideways or bent back as petals, but, as mentioned, this outer ring is still absorbing most of the energy as long as the plug width is not cutting into the final base region so that the petals are still of maximum thickness, even if only stubs. At the extreme, a pure flat nose will completely slice off the petals at their bases, forming a maximum-size, caliber-width, punched-out plug of about half-caliber thickness, prior to them being able to bend back at all, which abruptly drops the minimum NED value for this final bluntness increment to only about 8,350 at T/D = 0.55 caliber, considerably better than the standard M79 nose shape for such medium-thickness plates. Also, for a true flat nose, the U-shaped NED curve region completely replaces all other NED curve regions up to about T/D = 0.9 (possibly for plates even thicker than this, but I have no data at present). As mentioned above, the punched-out plug thickness seems to be limited by geometry to about half of the plug's diameter, so a plate thicker than about T/D = 0.55 for a true flat-nosed projectile - where resistance is a minimum due to the plug edge being easier to tear out of the plate than the stretching, dishing, bending, wedging, and petalling of other armor thicknesses - rapidly increases its resistance as the entire plate thickness must be now be bulged back and stretched over an increasingly wide area until the material directly in front of the projectile is thin enough to punch out as a plug - this is a very strong inhibition to using such projectiles when thicker armor might be hit, even though they do so well against circa-half-caliber plates (this is why the Japanese put the rather blunt, but not flat, "cap head" over the tapered flat nose of their "diving" post-WWI Type 88 and Type 91 AP/APC projectiles; the cap head would be knocked aside at high obliquity, where the tapered flat nose's sharp edge would dig into the impacted material and impede ricochet and thus be useful against any plate thickness and against the surface of the ocean, but the cap head would remain attached at low obliquity long enough to act as a regular, though rather rounded or bluntly-pointed, projectile nose, where a flat nose was so bad against thick armor). "NC" is a numerical constant. "J" is the Green's Function. "TEXP" is the effective plate thickness exponent. Other parameters are as previously defined. Note that the term where (PQF)(T/D) is raised to the TEXP power is the only place that the PQF is used in the calculation of the True NBL or Energy NBL for any impact. The values for the NC, the constants for calculating J, and the TEXP are all found in a look-up table based on ranges of plate thickness in calibers, T/D. This method of breaking the complex shape into smaller pieces for easier calculation is termed making the curve "piecewise smooth" so that each T/D range uses its own version of the general formula above, but the values merge smoothly at the borders to simulate a single, all-encompassing formula. Note that T/D is a function of total projectile Kinetic Energy; that is, in the formula the square root of W, not some other power, is used. Constants "JCA" and "JCB" and "JCC" are found in the same look-up table as are the numerical constant NC and the effective plate thickness exponent TEXP. J is 1.00 (not used) except for the two regions T/D ≤ 0.075 and 0.2549 < T/D ≤ 0.47931, both of which are regions where simple single-power-law (linear or quadratic or intermediate) relationships between T and VS are not possible without excessively complicating the formula. The value of M(OB,T) is a modified Secant(OB) (= 1/Cosine(OB)) curve, so that the unmodified Secant(OB) NBL increase, which is slow near normal obliquity and then increases faster and faster to a maximum of 5.759 at 80° obliquity, where my formulae stop, is modulated by the M'(OB,T) value tabulated in M79APCLC. For obliquity angles below 45°, plate thickness has no effect on M'(OB,T) and thus on M(OB,T). The minimum value of M'(OB,T) for OB ≤ 45° is at 42.5° and is equal to 0.879, giving an M(42.5,T) = (0.879)(1.3563) = 1.192, which is the value of the True NBL at 42.5° as a multiple of its value at normal. Obviously, the low M'(OB,T) cancelled out much of the gain in resistance due to the oblique impact - an armor plate tilted back 42.5° must be increased in height and in weight by 35.63% to cover the same region, while a vertical plate increased in weight and thickness by 35.63% would have a 1.309 multiple of its normal-impact NBL, which is obviously a better deal against a horizontally-moving projectile than tilting it back 42.5° with the same weight used in both plates. All in all, sloping homogeneous, ductile armor at 45° or less obliquity against an M79 projectile nose is a losing proposition compared to keeping the plate unsloped and merely making it thicker; only if some other benefit is obtained by sloping the plate should it be done. The reason for this is that the nose will dig into the plate and be deflected toward the normal so that EX will tend to be less than OB, sometimes much less, which means that the actual armor penetrated in the plate is intermediate between M(OB,T) and M(EX,T), which is obviously less than M(OB,T). which is the multiplier for the plate's normal-obliquity True NBL to get the plate's 80°-obliquity True NBL, this is still better than the 3.392 multiplier for the True NBL if the plate remained normal to the projectile and had its thickness increased by the geometric 5.759 times to match the 80° plate's weight increase. The cross-over obliquity for the M79 projectile nose shape, where a 0.25-caliber plate inclined at that obliquity becomes better (has a higher True NBL) than an unsloped plate increased in thickness to give the same total weight is 51.3°, where both plates would weigh 1.599 times an unsloped 0.25-caliber plate. Obviously, at any higher obliquity for this nose shape, even in the worst, 0.25-caliber-plate, case, the "virtual" increase in plate thickness due to increasing the glancing effects to cause ricochet always more than compensates, usually by a large measure, for the added weight of the longer plate to protect the same area compared to merely thickening an unsloped plate to the same total weight and trying to stop the projectile entirely instead of deflecting it. Note how the minimum resistance at the 0.25-caliber plate thickness is due to the plate having the least weight of armor get involved with trying to stop the projectile compared to either thicker plates, where the material to the side of the forming gouge and slot/hole must be pushed against to wedge the armor out of the way to reach the petalling layer at the plate back, or thinner plates, where dishing/flexing over a wide area by the entire plate thickness prior to petalling increases the energy absorption of the plate. In the 0.25-caliber case, only the plate material actually being pushed back by petalling is absorbing most of the energy with minimal dishing to the side of the forming slot/hole. This is also why inclining a plate at any angle gives better results than keeping the plate normal to the impact (ignoring the required enlarging of the entire plate to cover the same area); the oval impact region simply involves more plate weight than a cylindrical hole does. Note how the value for M'(OB,T) starts at 1.00 when OB = 0° (normal impact) and gradually decreases until OB = 42.5° and then increases very slightly for OB = 45°, so that the angling of the plate has less effect on increasing the True NBL than merely making it thicker without angling, due to the projectile nose digging into the plate and causing it to penetrate closer to normal (EX < OB), reducing the amount of armor material involved to less than an undeflected (EX = OB) projectile would have to pierce. Above 45°, however, even for the worst case of T/D = 0.25, the value for M'(OB,T) drastically increases as OB increases, levels off at about OB = 65-67.5° and then drops considerably down to give M'(80,T) roughly equal M'(55,T) for the thinnest (T/D near zero) and thickest (T/D > 0.9) plates, while dropping even further to M'(80,0.25) = 0.82 for the worst case of T/D = 0.25. The M79 nose shape has a pointed nose slightly over a caliber long with a weight of about 40% of a cylinder of its same height, but a surface area of more than half of the side of such a cylinder (a simple cone would have 33.3% of the weight and 50% of the surface area). As such, at oblique impact the pressure from the plate against that side of the nose pressing on the plate will tend to try to rotate the projectile in the glancing direction parallel to the plate face so that it will make a hole in the plate longer in the forward direction than would occur if the projectile was not deflected. The resultant increase in the length of the gouge in the plate, which causes an increase in plate resistance, goes up directly with increasing OB for a fixed VS. At the same time, the angle through which the projectile must be pivoted to cause it to ricochet off of the plate decreases as OB increases. Both of these effects drastically increase the True NBL for the M79 projectile nose shape as OB increases, with more and more of this increase being due to deflection effects rather than actually slowing down the projectile. However, as OB increases, the impact of the curved side of the nose of the projectile occurs earlier and earlier after the nose tip hits the plate. This causes the center of the plate's average resistive force on the side of the nose to move down the side of the nose toward the base of the nose, which decreases the leverage of the glancing force and slows down the pivotting effect. "WP" is the weight of the plug of plate material punched out of the plate when using a very blunt nose shape and assumed to have been ejected directly along the the future flight path of the projectile - which is zero in the M79 projectile nose shape case that we are using here, eliminating this term. The other parameters have been previously defined. However, we still do not know the value of EX or of VMIN, which is either the True NBL or a calculated Energy NBL, to use, which we must compute as defined below. The formulae for EX assumes that a projectile hitting at an OB > 0 is deflected more toward the normal at the True NBL and above, in fact EX = 0 when the True NBL is also the value of VS that gives a zero VR; that is, when the projectile is stopped by the plate, not merely deflected, as occurs in many cases for OB > 45°. EX = 0° at the True NBL when OB ≤ 45° or when a Base-First Penetration occurs at the True NBL when OB > 45°. If a Nose-First Penetration occurs at OB > 45°, the value for EX (and VR) will be greater than zero, since the deflection-only component of the True NBL does not slow the projectile down and it still tries to go at least somewhat along its original path even at the True NBL. EX is always assumed to be in the same plane as OB, so sideways deflection is ignored; this is not quite true since the projectile is usually spin-stabilized and this will bias the resistance and try to "roll" the projectile to one side or the other as it passes through the plate at a non-zero OB, but it is usually a rather small effect and should be taken into account by some sort of random adjustment over a range of at most 5° to either side of the OB plane. The deflection angle "(OB - EX)" is assumed to get smaller as VR increases, indicating that the plate has had less and less of an effect on the projectile's pre-impact motion. The value of (OB - EX) also decreases at the True NBL as OB increases in the range OB > 45° whenever a Nose-First Penetration occurs. This is because the minimum VR at the Nose-First Penetration NBL (whether or not it is the True NBL) is steadily increasing, which reduces the time that any deflecting forces have to operate on the projectile. This reduction in the deflection for all Nose-First Penetrations is roughly symmetrical about the OB = 45° point when VR is measured as the same percentage of the Energy NBL (= True NBL for OB ≤ 45°) at the given OB when OB ≤ 45° or at (90° - OB) when OB > 45°. We do this first by determining if a Base-First Penetration is possible using the criteria previously defined (maximum T/D and minimum OB). This formulae set is based on the EX formulae set, but rearranged to calculate the Energy NBL as the energy difference between a projectile that penetrates at the True NBL with EX = 0° and VR = 0 feet/second, as in the Base-First Penetration case, and a projectile that penetrates nose-first at the True NBL with the mirror-image EX = (90° - EX'), where EX' is calculated in the usual OB' ≤ 45° manner using OB' = (90° - OB) and VMIN = Energy NBL. This mirror-image formulae for EX that is symmetrical about OB = 45° is the result of a series of tests performed and documented at a major university, which is good enough for my purposes. If so, we must now see if VS > Nose-First NBL as previously defined. If not, then a Base-First Penetration has occurred, so OB' = 45° making SNCS = 0.5 for all OB, VMIN = True NBL, and EX = OB - (DF)[1 + (OB - 45)/45], which gives a simple linear approximation for the increase in EX as OB increases in the above-45° region, and which gives EX = 0° and VR = 0 feet/second at the True NBL for all OB, as required. Note that this calculation and the VR calculation that goes with it are very rough approximations because the projectile will be tumbling after it exits the plate and this will give large angular and speed errors. This is why the simple linear EX approximation is good enough. If so, then a Nose-First Penetration has occurred and we merely repeat the calculations in 2b to find the VMIN and EX to use in the VR calculation. In addition to the tumbling when a Base-First Penetration occurs, I usually assume that any deflection (OB - EX) of over 45° will result in such a torque on the projectile that it too will end up tumbling and/or wobbling so badly that a stable, nose-first motion can be considered highly unlikely thereafter. Even a 30° deflection will give a good chance of bad wobbling, especially if the projectile suffered any significant damage, while any projectile damage that is not symmetical about the projectile's centerline will cause the spinning projectile to rapidly begin to wobble and tumble, no matter how small the deflection is. The program gives a short explanation of the various parameters on screen and, if the user selects it, on a hard copy printer printout of this introduction. This INTRODUCTION HEADER takes up so much room that no results printout will be done on that hard copy page. The user can print out on the hard copy printer the results of any calculation run that he wants or he can merely have it print on screen, skipping the current run as far as the printer is concerned. When selected by the user, the program defaults to printing out the user's inputs and program's calculated results of two independent complete calculation runs per hard copy M79APCLC RESULTS page, one at the top of the page and one at the bottom. If desired, the user can select printing only the top half of a page which was previously calculated and output to the printer without printing the bottom half on that page (this resets the next calculation results to the top of the next printer page). This half-page hard copy printout will also automatically occur if the user terminates the program by selecting "N" when asked for "Another Run? (Y or N)" when a top half-page printout was sent to the printer but the bottom half-page printout was never done. This special half-page-only printer printout logic is needed for LASER-type printers, which do not print anything until the entire page is forced out by a final Form Feed. This M79APCLC program is written in Microsoft QuickBASIC 4.5 and compiled into a MSDOS-compatible EXE file which requires the QuickBASIC 4.5 Support Utility Program BRUN45.EXE be in the same directory as M79APCLC.EXE (this is the same support program needed for my FACEHARD.EXE program). The program's BASIC source code file M79APCLC.BAS, again as with FACEHARD.BAS, is in MSDOS ASCII text and uses only ASCII text for user inputs and screen/printer outputs. It can easily be changed to another version of BASIC or even used as-is in some other BASIC versions. Its listing is only 8 pages long, much of it being REM statements (comments) and large tables. I have developed a sister program to M79APCLC called M79LPRNT, which is compiled identically to M79APCLC and also requires BRUN45.EXE. It will allow a plate thickness range to be specified and a thickness step and will print out in a table the True NBL, the Nose-First NBL (if different from the True NBL), the AED, and the NED values for those plates in the range. It is a convenient way to develop penetration tables. Note that it does not calculate the Remaining Velocity VR or the Exit Angle EX, as the Striking Velocity VS is not an input. Its BASIC listing is also available. This article is copyrighted 1999-2017 by Nathan Okun and is reproduced on NavWeaps.com with permission.